Its an OF simm, and OF has issues with renaming things to a different name, so Im not sure if its really the Ithaca Class or not. Anyways.. Im trying to find it, and have had no luck. I know it used to be on Andrew Hodges site, but since its gone... no Luck.. They have an image of the base. That looks like someone calls it an Elysian Class Starbase. Could it be the same?? Also some reffer to starbase 47 and starbase ronin. 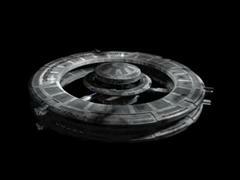 But that to me is more a regula class starbase. Confusing all those specs, but it looks like it wouldn't be too hard to build. Can you confirm this is what your looking for? Something like this would work? Or have you found the mesh? It just looks like there is no refference material on the net. This starbase Ithaca is a very simple model. You may want to ask me to create a similar model to illustrate your site. You could. I would end up with. But you're a great artist.